Providers of service to people experiencing homelessness are coordinating their efforts to end homelessness in communities across Connecticut by developing Coordinated Access Networks (CANs). Through these CANs, service providers work together to streamline and standardize the process for individuals and families to access assistance. 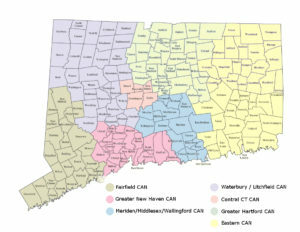 Coordinated Access is required by the Federal HEARTH Act, which governs most of the federal funding communities receive to address homelessness, and supported by the State of Connecticut Department of Housing. The primary goal is to help communities focus on rapidly ending each person’s homelessness by connecting them with appropriate housing and resources as quickly as possible. 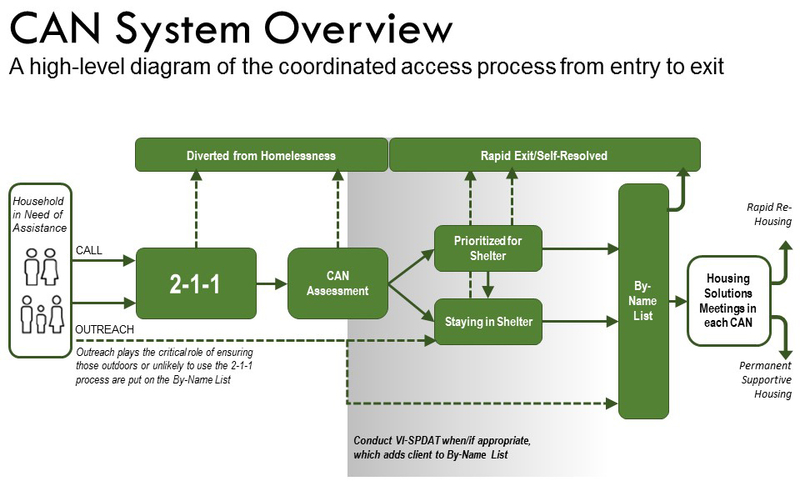 A standardized, assessment and referral process to access community resources within a geographic region for people experiencing a housing crisis or homelessness. Individuals and Families call 2-1-1 from anywhere in the state to start the process. 2-1-1 refers anyone experiencing a housing crisis to the CAN in the caller’s community. The CAN accesses available resources to address the client’s needs. Create a streamlined way for people in need to access assistance. Improve collaboration, communication, efficiency, and transparency between service providers. Accessible: easy to use and well-publicized to the homeless individuals and families who need it. Standardized: same process to access resources across communities, one shared assessment process across communities to understand client need and eligibility. Accountable: communities develop shared oversight mechanisms including policies, monitoring and improvement processes. This Webinar on Coordinated Entry brings together leaders in coordinated entry from across the country to discuss their models, qualities of an effective coordinated entry system, and key components of HUD’s Coordinated entry policy brief, such as prioritization of most vulnerable persons. The speakers focus on the role of coordinated entry in behavioral health and in the homelessness assistance system as well as how it can be valuable in connecting clients to SAMHSA-funded programs with housing resources that will best meet their needs.